ErtelAlsop > About ErtelAlsop > News and Press Releases > Filter Equipment > Filter Press > How Does a Filter Press Work? To best understand how a filter press works we will discuss the main components of the filter press and their function, then we will discuss the filtration cycle. A filter press has three main components: the carriage, the filter pack, and the filter media. The carriage (also referred to as the skeleton or framework) contains the following components: fixed head, moving head (also referred to as the follower), closure system, sidebars (or overhead beam), and face piping. The chief function of the carriage is to hold the filter plates together against the internal pressure experienced during the filtration process. The carriage also provides for the influent and effluent connections with the filter pack (face piping). These are the piping connections which pass through the stationary head and connect the feed and discharge manifold to the filter pack. Depending on the ancillary equipment supplied, a filter press carriage may have some additional function such as plate shifting for cake discharge, automatic cake release, or cloth washing. The filter pack (also referred to as the plate stack) consists of the filter elements stacked in order that create a hollowed chamber for solids collection between two drain fields. The filter pack is where the solid liquid separation process takes place. The efficiency of the filtration process is heavily dependant on two things, the characteristics of the solids in the slurry, and the filter media that is used. The type of filter media selected will determine the type of filtration that will occur. Utilizing ErtelAlsop’s Filter Cloth media allows for surface filtration. 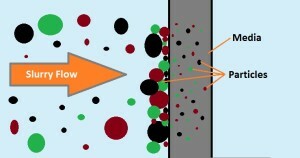 Surface filtration works by stopping particles larger than the pore size of the media; as particles build on the surface the filter cake develops. Most of the filtration is performed by the developed filter cake. As the filter cake continues to build the efficiency of filtration increases and finer particles are captured in the matrix of the filter cake. Because filtration occurs on the surface of the filter cloth, the media can be used throughout many filtration cycles without needing to be replaced. Utilizing ErtelAlsop’s cellulose based Depth Filter Media allows for depth filtration. Depth filters work through several steps for particle capturing including: sieving, interception, adsorption, and absorption. Similarly to surface filtration the developed cake offers additional filtration. Depth media becomes saturated with solids through the filtration cycle as interstitial spaces become filled with particulates. Once fully saturated the depth media is replaced with a new sheet and the filtration process can begin again. The filtration cycle can be broken into the following steps: filling, dewatering (solid-liquid separation), cake wash and air blow, membrane (if applicable), and finally emptying. Dewatering processes are performed using filter cloth or paper media and high pressure processes. Depth media is generally used for polishing or more refined filtration with low pressure processes. During the filling process solids laden slurry is pumped under pressure into the filter press chambers through the piping at the stationary head of the filter press. Solids within the slurry will flow to the area of cake development with the lowest pressure differential, resulting in a filter cake which builds uniformly over the drain-field on either side of the chamber walls. As each cake chamber fills with slurry, the liquid passes through the filter cloth, filter paper, or depth meda, across the drain-field, through the drain ports and exits via gravity out of the corner discharge eyes. With a gravity drain on the filtrate side of the press, a pressure differential between the feed pressure and the gravity discharge is created across the media and the filter cake solids as they build in thickness. It is the existence of this pressure differential, not just the feed pump pressure, which causes the filtering action to occur. The first one third to one half of the filtration cycle, when the majority of the total cake solids have been pumped into the press, is referred to as the fast fill stage. Dewatering, also known as the compaction or consolidation stage, is evident when the flow rates begin to taper off as the cake builds in thickness and the pressure differential increases. The solids deposition process continues until the filter cakes forming on the individual chamber walls bridge at the center, completely filling the press with solids. Solids are continually pumped into the chamber reducing interstitial space by compacting particles; it is during this final stage that the filter cake achieves maximum dryness. When a filter cake is fully developed, the filtrate flow rate will have reached a point at which the reduction in the filtrate flow is so low that the rate appears almost constant. In practice, this rate will become so low that to continue running the filter press would be inefficient. When first initiating a new filtration application, a guideline to determine the end of the filtering cycle is when filtrate discharge rates fall to: 0.16 gpm/ft2 of filter area (every cake product has a different terminal filtrate discharge flow rate based upon cake characteristics and should be developed through experience). If the cake contains desirable components that require subsequent processing, undesirable components can be flushed from the cake by means of water or an appropriate solvent. The general rule for cake washing is 1.5 gallons per hour per square foot of filter area. 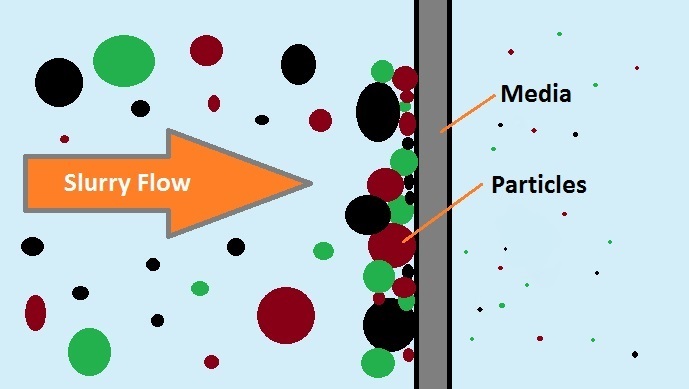 This is considered to be an average washing flow rate, however the actual flow rate depends largely upon the cake density and the degree of chamber fullness. Cake washing can vary from an average minimum flow rate of ~ 0.50 gallons per hour per square foot of area up to ~ 5 gallons per hour per square foot of area or more. 1B & 3B plate discharge porting configuration should be utilized and adequate open cake space in the chambers should be allowed for uniform and complete cake washing. Air blowing cakes can be utilized for additional moisture reduction. Air can be introduced into the chambers either as a core blow, following the same direction of slurry flow; or as a reversed flow through 1B & 3B ported plates allowing a more uniform and complete dispersion of air across the filter cake. Under most circumstances air flow is determined as follows: 1/4 to 1/2 SCFM per square foot of filter area with 30 to 50 PSIG maximum. If membrane squeeze plates are utilized, the membranes can be inflated using either air or hydraulic pressure applying a mechanical force on the filter cake contained in the chamber. 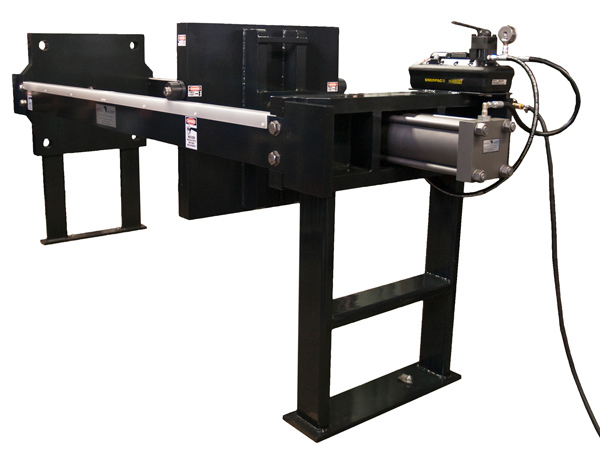 This mechanical squeeze will physically compress the filter cake and force out additional moisture held within the cake resulting in drier cake solids. The last step in the filtration cycle is to remove the de-watered filter cake and ready the filter press for the next batch. The closure system of the press is retracted, the individual filter elements are separated and the collected solids (filter cake) are discharged, usually by gravity, to an appropriate receptacle. As the individual filter elements are separated they should be inspected to be sure there is no residual filter cake left on the sealing surfaces, and there is no damage to the filter plates. Filter cloth should be inspected for tears, abrasions, or abnormal wear patterns and replaced if necessary. If depth media is used, fresh filter sheets should be fitted in place prior to performing the next batch. ErtelAlsop offers filter presses with a range of optional equipment add-ons including: thorough-wash capability, even fill manifold, plate shifter, plate shaker, self dumping cake carts, bomb-bay doors, cake chutes, casters, Vapor Master® enclosures, platforms, safety light curtains, emergency stop pull cords, and cloth wash systems. ErtelAlsop filter presses can be fully automated and incorporated into your plant system or can function independently. Our automatic filter presses are built and programmed in house utilizing Micrologix control systems and PLCs. ErtelAlsop offers a full range of filter presses from our Laboratory Accuscale series filter press to our full production scale Automatic Filter Press offering over 283ft³ (8m³) of solids capacity! By erteladmin | Published May 4, 2015 | This article was posted in Filter Equipment, Filter Press, Plate and Frame Filter and tagged dewatering, filter cloth, Filter Press. Bookmark the permalink. Follow comments with the RSS feed for this post. Post a Comment or leave a trackback: Trackback URL.